When making the elderflower dish, I realised that boiling using a three – footed pot was a bit different from using a stove. Most imagery, and the layout of most hearths seem to indicate that the pots were used to cook over the embers rather than the actual fire. This produces a more even and controlled heat if not as intense and covering as having a pot directly in the flames. Usually when boiling milk one have to watch ones back at all times as milk usually tend to boil vigorously and burn the moment you turn your back to it. Not so when using the pot and embers, the milk simmered away just below the boiling point, drawing out the flavour of the elderflowers without being burned. While it may be a problem in other dishes, it was quite suitable in this context having this slow and controlled heat. That said, my hearth is still smallish and I am only able to get so much embers out of it, with a larger fire, and more skill at keeping the fire, I should be able to get enough embers to surround the pot better thus making it get to a boil more quickly. However, regardless of this lack in regards to the amount of embers I still think that there is a valid point in the way one can controll the heat using embers. Today, the part of Sweden in which Glimmingehus is situated is wellknown in Sweden for its orchards, and though the types of apples may have changed and other fruits or plants may have dominated the landscape of the time, it is safe to assume that that if they wanted the people of the manor would be able to get hold of some apples if desired. As an homage to the present day apple growers and a bit curious about a dish that I have mainly seen in German renaissance cookbooks and Danish baroque cookbooks, I wanted to make a dish called puffed apples. In the cookbook of Sabina Welserin I could find two different recipes for the same dish and the Danish cookbook from 1616 provided the third slightly different recipe. Then put flour in a bowl and put some fresh spring water therein. It should not be too thin. And beat the batter very carefully, thin it after that with eggs, and when you put the thin apple strips in the pan of butter, then shake the pan well, then they rise up. Take milk with a little water in it and heat it well, until you can still just stand to dip a finger into it. Make a firm batter with flour, beat it until it bubbles, lay eggs in warm water and thin the batter with them. Cut the apples in circles and as thin as possible, draw them through the batter and coat them with it. Shake the pan, then they will rise. And the fat should be very hot, then they will be good and rise nicely. LXVII. Eble i Smør at bage. Skal dem/oc skær huer i to eller fire stycker/lige som de ere store til/tag det huide aff Eg oc sla ræt vel/giff der vdi lidet Salt/giff Eblene der vdi/oc giff dem siden vdi Huedemeel/saa at de ere gantske tørre/leg dem siden vdi siudeheed Smør/bag dem at de bliffue smuck møre/giff dem siden op oc bestrø met Sucker. Although the recipes differ some all can be said to be a sort of side dish made of pieces of apple, though the Danish ones are sweeter, I do not think that it necessarily reflects what we would call a dessert but rather the increasing sweet tooth in Europe at the time. The first two dishes were rather similar as it required the apples to be put in a batter, that more or less reminded me of a pancake batter. In the first recipe I used butter and in the second one lard to fry in. Perhaps I made the batter a bit to thick as the apples were not really puffing up as much as I would have expected. Though the question if I a) managed to get the pan hot enough and b) if by puffed up apples we are supposed to be expecting a fritter like we can get today. The third batch was a bit different as it used no real batter and thus were not expected to puff up. All three samples were rather taste with the Danish perhaps a bit closer to what we would expect today as it was slightly sweetened. As I used slightly sour apples for this dish it would have fitted well as a side dish. The choice of slightly sour apples,was deliberate as it was possibly a bit closer the apples that could have been found at the time. However In the process of being fried some of the acidity is lost. Of the three samples the apple circles baked in lard was the most appealing to the eye, and surprisingly the one most prefered by my co-workers. 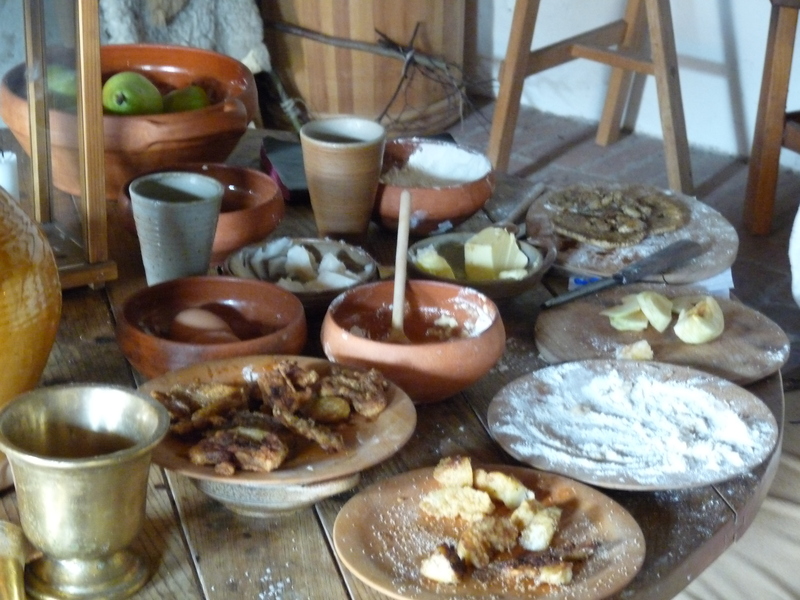 During the weekend of 18-19th June a small renaissance festival was held at Glimmingehus, among the invited groups and crafters was couple that among other things churn butter and brew beer. Grethe which had used similar breadovens could give suggested from previous experiences that a good way of deciding the right temperature for baking was to observe when the walls were white instead of black. And most certainly after a few hours firing the walls were indeed white instead of black. This suggestion will be good and can be combined with other was to observe the proper temperature in the oven. As this took place during the festival, where I gave out samples of renaissance food I realised to late that I had no time to for any other experiments. Grethe, however, managed to bake some bread in the oven. In order to get myself a bit more familiarised with the kitchen I started of lightly with a few investigations that were not completely dependent on getting the heatng, embers and fire wood completely right. 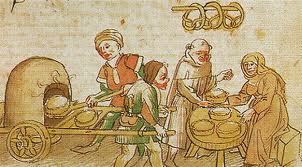 Both in the medieval and the renaissance cuisine pies and pastries seem to have played an important role, and the role of the pastry chef was quite important. Pastries seem to range from mere vessels containing meat or fruits to elaborate subtleties depicting castles and the like. In “Book of caruynge” the reader is given instruction on how to cut a pie according to how it was shaped and what it contained. The main question is however, were the actual pie crust intended to be eaten or was it just used as a vessel? Did they use some kind of pie shell or were they standing by them selves? Though I have mainly favoured the latter interpretation, some more work with early pie-recipes may give some insights. Though the earlier pie recipes rarely give any further clues to the actual pie dough, some recipes from the mid 16th century gives us some further clues. For this experiment I have used two recipes from the cookbook by Sabina Welserin and an English recipe from about the same time. Take flour, the best that you can get, about two handfuls, depending on how large or small you would have the pie. Put it on the table and with a knife stir in two eggs and a little salt. Put water in a small pan and a piece of fat the size of two good eggs, let it all dissolve together and boil. Afterwards pour it on the flour on the table and make a strong dough and work it well, however you feel is right. If it is summer, one must take meat broth instead of water and in the place of the fat the skimmings from the broth. When the dough is kneaded, then make of it a round ball and draw it out well on the sides with the fingers or with a rolling pin, so that in the middle a raised area remains, then let it chill in the cold. Afterwards shape the dough as I have pointed out to you. Also reserve dough for the cover and roll it out into a cover and take water and spread it over the top of the cover and the top of the formed pastry shell and join it together well with the fingers. Leave a small hole. And see that it is pressed together well, so that it does not come open. Blow in the small hole which you have left, then the cover will lift itself up. Then quickly press the hole closed. Afterwards put it in the oven. Sprinkle flour in the dish beforehand. Take care that the oven is properly heated, then it will be a pretty pastry. The dough for all shaped pastries is made in this manner. Take rye flour, according to how large the fish is, take it, and put water, about three pints, in a pan and a good quarter pound of fat into it, and let it cook together, put the flour on the table and put the solids from the melted fat-water on top, until it makes a good firm dough. You must knead it well so that it becomes good and sticky. Afterwards make two parts out of it. First the bottom, roll it out as large as the fish is. After that lay the fish on the bottom crust and roll out the top crust just as wide and put it over the fish and shape it like the fish. Make fins on it and take a small knife and make dough scales, also eyes and everything which a fish has. And put it in the oven and spread it with an egg. Then you have a fish pastry. To make shorte paest for tart. Take fine floure and a curtesy of faire water and a disshe of swete butter and a litle saffron and the yolkes of two egges and make it thin and tender as ye maie. As it was only a trial to see how I could make the dough stand without any aid of a pie shell, they were made without any filling and just to see how I managed to shape them. One of the recipes – the rye dough was meant to be shaped like a fish and not as a regular pie, so that one I just made into an empty fish shaped pastry. The recipes were followed rather closely, though the amounts were headed only superficially. To a pair handful of flour I mixed an egg, after which I added a mixture of lard dissolved in water. The resulting dough was rather rubbery dough that at first seemed to have had some problems in getting the sides to stand. After I twisted the sides into the classical s-shape of pies the sides kept standing. The butter based dough in the third recipe was perhaps slightly softer, but should not have proven any problem. With my modern preferences I would have used the third dough for a sweeter dish and the first one for a more savoury pie, as the use of lard gave the pie a distinct association to bacon. However, the main observation was that all the doughs that were meant to hold a mixture or even a liquid content seemed to be able to keep their walls up and hence not losing any of their contents. It should therefore be possible to bake pies without the use of any pieshells or the like. While it is likely that these ashen bottomed piecrusts were merely used as vessels for cooking and serving, I would find it likely that these remains of the pies wandered down the hierarchy and were used as a handouts. Although I would conclude that most pies were baked and served in their dough, there are some mentions of a pie-shell in the mid 16th century recipes, so it is possible that both existed. The rather common occurance of pies in 16th and 17th century recipes will certainly have me revisit them. Weekend and no experiments or Viking cooking done in a few days, so I decided to make an early baroque recipe from the earliest printed Danish cookbook. A quite simple dish that did not require anything I could not get hold of in these parts. LXX. Spinat paa Vngerske at koge. Tag rød Løg/skær dem smaa/oc giff smaa Rusiner der iblant/oc giff vdi en Potte/leg der til denne Spinat/oc tryck den vel tet ned i Potten/giff saa der offuer helten Vand/oc helten Vijnedicke/oc lad det hastelig indsiude/at der icke bliffuer formegit Saad offuer/giør det vel til met sucker/at det ey bliffuer forsøt eller surt/oc giff saa dervdi Bomolie (eller smør) smag om det er til maade/oc salt det til pass. Naar du vilt rette det an/saa leg om Fadet sødne Negenøyen/steegt Lax/eller andre steegte Fiske. Take red Onions/cut the finely/ and add small Raisins to it/and put it in a Pot/add some Spinach/and press it down into the Pott/add to it half Water/ and half Vinegar/ and boil it quickly/so that there will not remain to much sauce/ do it well with sugar/so that it will not be to sweet nor to sour/and do in there Oliveoil (or butter) taste to see if enough/and salt as is suitable. When you want to serve it/ place around the Plate simmered Lampreys/fried Salmon or other fried fishes. I followed the recipe without giving much heed to the amounts. I took half an onion, chopped it, added some raisins to about half a package of defrosted frozen spinach. Added some water and vinegar…about 2/3 water and 1/3 vinegar as I assumed that fresh spinach will release more water. After it had boiled I added some butter two pinches of sugar and a bit of salt. Let it simmer some more then served it with a piece of really cheep fried salmon. The result, a sort of sweet and sour spinach mix, that I found quite pleasing. 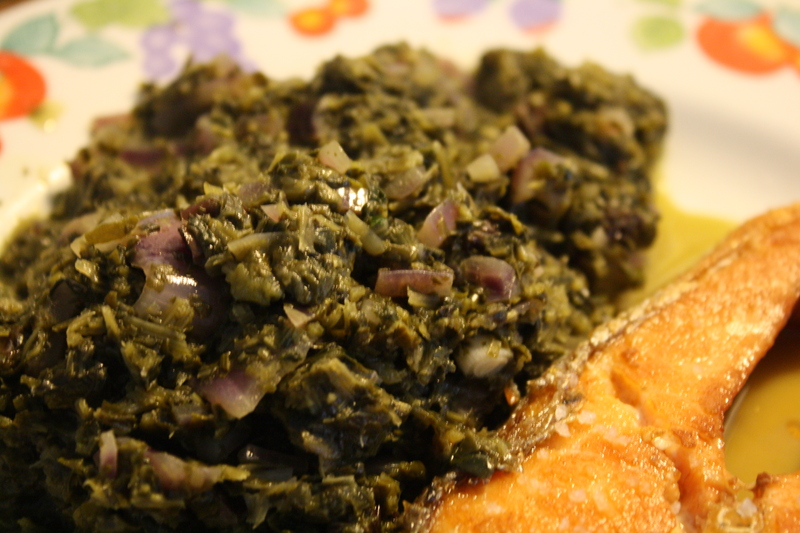 The combination of the sweetness of raisins and acidic taste of vinegar goes really good together and gave the spinach a more filling character. Not to expensive and something I could do again. The acidity went quite well with the fat salmon dish.